Most dog owners think of their pets as members of their family, and as such, want only the best for them. But what do you do when the most important thing when it comes to your pet’s health – canine nutrition – and what makes it “the best” is interpreted differently by each food brand? Do you go with the most expensive brand, most popular or maybe vet-recommended? Believe it or not, there are dog food manufacturers out there that are not ridiculously over-priced, are incredibly nutritious and healthy, but are not highly popular. Such is NutriSource, a super premium dog food that is made in Perham, Minnesota. According to the company, all recipes are made with quality ingredients that are sourced locally and tested rigorously. But is this brand the right fit for you and your dog, and if it is, which formula is the best? To find out, check out our NutriSource dog food reviews and buying guide. Small breed dogs and puppies have different nutritional needs than adult and large-breed canines. For one, they often need more nutrients than their adult counterparts, and two, they prefer smaller-sized kibble as it’s easier to eat. This NutriSource pet food checks all the right boxes. Made with four key ingredients, it is high in protein, healthy fats and other important nutrients that work together to promote health and well-being in small and medium-sized dogs, as well as puppies. There are two animal protein sources here – chicken and menhaden fish. Whole grains are also present, including brown rice and oatmeal, but also flaxseed, white rice, dried beet pulp and tomato pomace. Of course, the recipe is also enriched with vitamins and minerals and even contains probiotics to repair and promote gut health. But that’s not all – this formula also includes Taurine which helps support heart health, and DHA, an omega-3 fatty acids that’s important for proper brain development in puppies. Perfect for all breeds and life stages, this NutriSource dog food contains a balanced ratio of protein, fat and carbohydrates. Made with easily digestible ingredients, but excluding grains and potatoes, it’s an ideal food for sensitive pets struggling with poor digestion. Besides chicken and peas, this recipe also contains flaxseed, alfalfa meal, salmon meal, egg product, dried tomato pomace and other ingredients. Along with supplements including vitamins, minerals, probiotics and Taurine, this formula delivers excellent nutrition that is highly bio-available. There is also added Glucosamine and Chondroitin Sulfate for healthy joint function, which is especially important for aging dogs. Like all NutriSource foods, this kibble is also is free from all artificial additives, plus corn, wheat and soy. However, for extremely sensitive dogs, it’s worth noting that like most NutriSource’s recipes, this one too contains natural turkey and chicken flavor. Whether you own a young German Shepherd, Labrador Retriever, or any other large breed puppy, this NutriSource recipe is worth checking out. Made with chicken and rice, with a very balanced ratio of macro-nutrients, Large Breed Puppy formula provides premium nutrition with maximum bioavailability for large breed pups. Packed with nutritious foods, this recipe contains quite a few healthy, colorful ingredients, including chicken, brown and white rice, barley, oatmeal, peas, flaxseed, menhaden fish and others. It’s also enriched with all the necessary vitamins and minerals, as well as probiotics which boost digestive health and promote better absorption of nutrients. If you’re wondering about the quality of meat, NutriSource states they only use fresh and humanely certified chickens that were raised on farms. Although there is added natural turkey and chicken flavor, the recipe is otherwise free from all artificial colors, flavors and preservatives, so it’s a good choice even for sensitive pups. NutriSource’s best-selling dry dog food, Adult Chicken & Rice is a fantastic blend of nutritious ingredients that help promote adult canine health. Formulated to satisfy the needs and cravings of all breeds and all life stages, this kibble is a good choice whether you have a senior Lab, an adult Rough Collie or a Maltese puppy. Chicken, brown and white rice, barley, oatmeal, menhaden fish, flaxseed and dried brewers yeast are just some of the ingredients found in this kibble. With 26% of protein and 16% of fat, the recipe well-balanced and suitable for moderately active dogs. As for supplements, besides the usual 23 essential minerals and vitamins, this formula also contains Taurine for heart health, Glucosamine and Chondroitin Sulfate for better joint function and probiotics for gentle digestion. There’s also a little bit of DHA omega fatty acid which is important for neural development of puppies. Looking for NutriSource grain free dog food reviews? Check out Seafood Select, a simple, tasty and highly nutritious kibble that is ideal for sensitive dogs. Made with real salmon, this dry dog food is moderately high in protein and healthy fats, including omega-6 and omega-3 fatty acids, which are necessary for overall health and well-being of canines. There are two animal protein sources here- salmon and menhaden fish. Besides this, the formula also contains peas, alfalfa meal, flaxseed, tomato pomace, sunflower oil and other foods. As you can see, there are no grains or potatoes present, which is a good thing for sensitive dogs who may have food intolerances or poor digestion. To provide complete nutrition, the recipe is enriched with all the essential vitamins and minerals, but it also contains other supplements, including Glucosamine and Chondroitin Sulfate and probiotics. If you’re looking for a rich, highly nutritious dry dog food that is also easy to digest, you’ve found it. High Plains Select features several animal protein sources plus legumes to deliver superior nutrition for all breeds and all life stages. As usual, all meats are fresh and sourced from ethifcal vendors, so quality is guaranteed. This recipe contains beef, trout, turkey and menhaden fish as ts primary protein sources. There are also three different legumes, including garbanzo beans and red and green lentils. Like most NutriSource foods, this one too contains mostly low glycemic ingredients which help promote proper blood sugar levels. To provide a balanced and complete diet, the kibble is fortified with all the vitamins and minerals cacacanines nines nines need to be healthy and thrive. This includes all breeds and dogs of all ages, even puppies as the formula contains plenty of essential fatty acids necessary for proper brain development. We’re ending our Top 7 list with Prairie Select, the food that delivers excellent nutrition with flavor punch. Nicely balanced in macro-nutrients, but without grains or potatoes, this pet food is best suited for dogs with digestion problems or those with grain/potato food sensitivities. Besides quail and duck (first two ingredients), the recipe also contains green lentils, garbanzo beans, peas, turkey, sunflower meal, flaxseed, red lentils and other highly nutritious but easy-to-digest ingredients. Of course, there are added supplements as well, including all essential minerals and vitamins, as well as the usual in NutriSource foods – probiotics, Taurine, Glucosamine and Chondroitin Sulfate. Thanks to its well-balanced formulation, this kibble can be consumed by all breeds and dogs of all life stages. And if you’re wondering about artificial additives, you’ll be pleased to hear that besides natural flavors, there are none. If NutriSource pet foods have caught your attention and you’re considering giving them a try, take a look at our buying guide first. Here, you can read about the history of the company, the ingredients they typically use in their recipes, and our opinion about the quality of their formulations. So, whether you’re interested in NutriSource puppy food reviews, adult formulas or grain-free recipes, read on! According to their website, NutriSource is a family owned company located in Perham, Minnesota. Made by KNL Family Brands, specifically Tuffy’s Pet Foods, it was established in 1964. This year marks 55th year of their operation, making them one of the oldest pet food brands on the market. Being located in Minnesota, the company sources their ingredients locally, purchasing from trustworthy suppliers. They underline the importance of supporting family-owned businesses – although they already work only with suppliers that produce foods ethically, they give preferential treatment to those still owned and operated by their families. While being a smaller, family-owned business has its advantages (among other things, consumers seem to prefer these types of pet food brands), the price is usually paid in popularity, or to be more precise, in the lack of popularity. 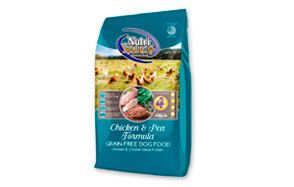 Based on our research, NutriSource really do use locally grown and sourced, quality ingredients in their pet recipes. Still, they’re nowhere near as popular bigger companies such as Purina, Pedigree or Merrick. This is unfortunate, as all recipes we reviewed are nutritious, healthy and highly palatable – something many pet parents spend years looking for. Nevertheless, with more than 50 years of experience in making pet foods, NutriSource have made a reputable name for themselves, which is reflected in their loyal buyers. Usually, when dog owners find a food that is just right in all important departments, including nutritional value, taste and price, they stick to it, and NutriSource consumers are no different. If you’ve never tried this brand of pet food, we highly encourage you to do so – it’s likely both you and your dog will never look back! If you’re looking for corn, wheat and soy free dog foods that are high in protein and healthy fats but relatively low in carbohydrates, NutriSource could be the pet food for you. All of their recipes, whether they’re formulated for puppies, large breed adults or seniors, contain wholesome ingredients. This includes quality proteins, whole grains, vegetables and legumes. But most importantly, all of their pet foods are formulated to meet or exceed nutritional standards set by the AAFCO. This means that no matter which recipe you choose, you’re guaranteed to purchase food that provides complete and balanced nutrition, meaning enough protein, fat, carbohydrates, as well as vitamins and minerals needed for canine health. 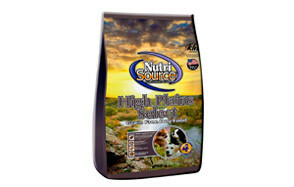 Another plus of the NutriSource brand is their wide selection of pet foods. From breed-specific formulas, to different life-stage dog foods, to grain-free recipes, this company has pretty much every pet-related concern covered. From a consumer’s point of view, this is both a blessing and a curse. A blessing because no matter the food you’re looking for, you’re bound to find it here, but a curse because if you don’t know exactly what your dog needs, a big number of options can be confusing. Saying that, it’s always better to have many choices available because even if you find a food your pet loves the most, rotational feeding is still recommended. Finally, let’s talk about the price. While definitely not the cheapest brand around, NutriSource is reasonably priced. Considering all of their recipes feature quality meat or fish as the first ingredient, legumes, vegetables and seeds (depending on the recipe), all the necessary vitamins and minerals, plus several supplements that the AAFCO doesn’t recognize as essential, their prices are sensible. It also helps they don’t use any fillers – no matter the recipe, you’ll never find wheat, corn or soy here. Not that there is anything wrong with these ingredients when used in small amounts in well-balanced formulas, but if you’re going to pay a decent price for pet food, it better not contain any of these non-essential ingredients. Because they avoid unnecessary ingredients, many of NutriSource grain-free formulas are suitable even for sensitive dogs. Although we looked for NutriSource dog food recalls for a good couple of hours, we weren’t able to find any. This is rather surprising considering the company has been in the business for decades. So what does this tell us? First and foremost, that they’re very serious about their sourcing practices. As mentioned, the company buys only from local, trustworthy, and preferably still family-owned and operated suppliers. Secondly, they own a state-of-the-art manufacturing facility. Their website states that they’re rigorous when it comes to raw materials that enter their facility – every single raw ingredient is tested for bad pathogens before entering. Even the air that touches the raw materials is segregated from finished products so it doesn’t touch them! For now, NutriSource appears to be a great pet food brand that produces a variety of quality dog foods. However, until we take a closer look at the ingredients they use in their recipes, we can’t know for sure, can we? Checking what kind of protein, fat and carbohydrate sources they typically use in their formulas can tell us whether or not their prices really match the quality of their products. So, without further ado, let’s jump right into NutriSource dog food ingredients! 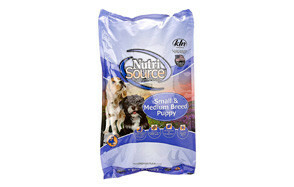 NutriSource typically makes their dog foods using real chicken or lamb as the first ingredient. No matter the recipe, there is an average or above average amount of protein, which is around 25%. Saying that, there are quite a few formulas that actually go above 30% of protein, which is ideal for healthy, adult dogs who are moderately to highly active. Things you’ll normally see in NutriSource recipes, are chicken and chicken meal, lamb and lamb meal, menhaden fish meal and other meats and fish, including beef, salmon and turkey. Although most NutriSource recipes contain an average amount of fats, which is around 15%, many formulations contain much more than that. While some pet parents may reflexively think this is unhealthy, it’s not – at least for active dogs and those with skin and coat issues. Importantly, the company uses healthy fat sources, including chicken fat, sunflower oil and fatty fish. But perhaps most importantly, the company manages to provide an almost ideal ratio of omega fatty acids. Specifically, omega-3 fatty acids are present in high amounts - normally, omega-3s are actually hard to find in sufficient amounts in typical, budget-friendly dog foods. For instance, their Small and Medium Breed Puppy Dry Dog Food recipe contains 1% of omega-3 fatty acids and 3.9% of omega-6 fatty acids, which a near-ideal ratio. Bottom line? Their food is a great choice if your pet is moderately to highly active. However, if you own a pet that mostly leads a sedentary lifestyle, we'd suggest to look someplace else. NutriSource state that most of their foods are low glycemic, meaning they’re slow to digest and as such, don’t spike blood sugar. This is mostly thanks to the carbohydrate sources they use in their recipes. Typically, you’ll see a couple of whole grains (unless grain-free, of course), including brown rice and oats, and a few easily-digestible legumes, vegetables and plants. The usual ingredients include flaxseed, dried tomato pomace, white rice, dried beet pulp and a few others. All in all, a nice mixture of nutritious carbs that are high in vitamins and minerals and relatively high in fiber. Another interesting bit is that they stay away from corn, wheat, soy and often potatoes. This is a huge plus for pet parents of dogs predisposed to diabetes. All NutriSource dog foods meet or exceed the nutritional requirements set by the AAFCO. This means that every recipe contains all essential vitamins, minerals and antioxidants needed for canine health and well-being. Furthermore, the company also includes supplements not deemed as necessary by the nutritional authorities, including probiotics for better digestion and nutrient absorption, Glucosamine and Chondroitin Sulfate for better joint health and Taurine for heart support. Now that we’ve covered all the important info about NutriSource and their dog foods, it’s time we focus on the brand’s major pros and cons.